The goal of this website and blog is to encourage, facilitate and inform parents who are homeschooling, or wish to homeschool, their children in the state of FL. 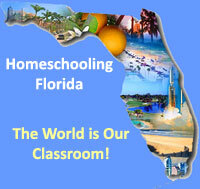 The editors of HomeschoolingFlorida.com are homeschooling parents and long-time FL residents. Although we do have a backgrounds in the teaching profession, we believe that any parent who has the sincere desire to teach their own children should be allowed to. It is our goal, through this website, to inform our readers of issues affecting the homeschool community in FL, as well as share ideas, insights, trials, challenges and resources. Please feel free to email us with any questions you may have about homeschooling in FL. The head of our team, Curtis Tucker, is a certified FL teacher and is available for homeschool evaluations and testing anywhere in the state. For more information about his services, please visit his website at www.Homeschool-Evaluations.com. We also publish several other homeschool-related websites, namely: www.HomeschoolingGirls.com and www.Childrens-Book-Reviews.com. Advertising is available on HomeschoolingFlorida.com in the form of banner ads. To set up an ad please call 1-877-228-1569. There are over 48,000 homeschooling families in the state of FL. For more statistics, see the Annual Report on Home Education published by the Florida Dept. of Education. Horizontal banner at the top of every page, 468×60 px, in rotation above the fold – $95/month, or $950/year. Square banner at the top right of every page, 125×125 px, in rotation above the fold – $75/month, or $750/year. We can make a banner for your company or product if you do not have one. Rates include traffic tracking statistics and any changes as needed. VISA, MC, check accepted, all ads must be prepaid. Please bookmark this site for future reference & thanks for stopping by! Is this a free site to join?I am going to homeschool my 5yr old,starting today.Sept 3rd 2010 any hints will be wonderfull.Thank You. Connie, yes this is a free site, no joining necessary, unless you wish to comment. I hope your homeschooling journey is going well and feel free to ask any questions you may have. We will do our best to answer them! I am a Golf Professional (30+ years) and have recently started a golf academy in Ponte Vedra Beach Florida. I am interested in offering a golf program to home schooled juniors geared around swing instruction, rules of the game and playing tournament golf. Can you please steer me the proper direction to get this notice out to the community. Would you be so kind to pass the word re our Prom for home school high school students? (At The Palace Grand April 20th)This would be a wonderful opportunity for those who would like to go to a prom, but are unaware there is one coming up in April just for home school students.. There’s more information on the web-site, ddandd.yolasite.com Thanks for your help, posting a note for us! Any idea would be appreciated as well! Hi, thanks for visiting HomeschoolingFlorida.com and expressing your interest in promoting your golf academy to the homeschool community in North FL. Please forgive us for the delay in responding. Since your comment was posted, we have added the ability to post listings and buy ad space on the site. The rates are extremely economical. Hi, thanks for visiting HomeschoolingFlorida.com and expressing your interest in promoting this Homeschool Prom. What a wonderful event! We recently added the ability to post listings and buy ad space on the site. The rates are extremely economical. Hello, I have tried multiple times to submit an email through the contact button on the page where I was redirected when I selected “About” above. However, my message is rejected each time. I was particularly interested in letting you know of updated information for Osceola County, as the home education office has relocated and is no longer at the address listed on your page for Osceola. Is there a good way for me to send you the updated information? Or should I just post the link with that information as a comment here?